With constant business demand for new services, IT must deliver and support an ever-increasing range of physical and virtual infrastructure. With resources constrained by tighter budgets, the only solution is to manage this demand more effectively. Providing a service catalog has emerged as one of the most proven vehicles to meet this challenge. Making the decision to adopt a service catalog and following ITIL best practice around service catalog management only gets you so far. Selecting a "fit for purpose" tool that will not only meets the requirements of you and your customers today but can grow and adapt to future requirements, is essential to ensure optimum return on your investment. 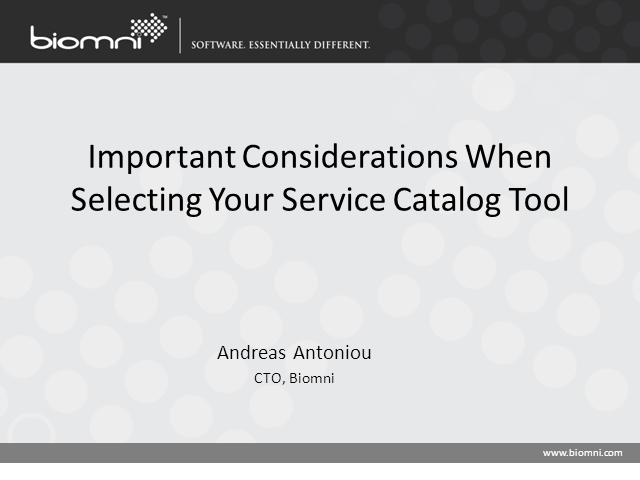 This session from Biomni, will reflect on the benefits of adopting a service catalog while focusing on the key features to look for when selecting a tool for the management and publication of your services and automation of resultant service requests. It will call on Biomni's extensive experience of a global customer base, currently spanning over 1.2 million production users across organizations of varying size and complexity. Join presenter Andreas, Chief Technology Officer at Biomni in this webinar. Andreas is responsible for product management and engineering. He has more than 20 years’ experience with self-service and workflow software solutions primarily within a web based and Microsoft architecture. Andreas joined Biomni as a co-founder in 1999 from Dealogic where he started as a software developer in 1992 before advancing to Managing Director of the e-Commerce products division in 1998. Andreas holds a Master of Science degree in computing from Middlesex University. Delivering IT as a Service is the primary goal for IT organizations and service providers alike. The benefits are huge for both IT and the business, empowering each to react quicker to business demand and change. Cloud and Virtualization has revolutionized the consumption of IT services. A customer can raise an order and then have access to new servers, applications and IT services within a few minutes. However there has been some inevitable trade-offs. For all the positives, like the IT agility, speed to market gains and flexibility; there are of course negatives. The primary compromise of having ‘off-site’ virtual assets is that you cannot ‘wrap’ your Cloud/Virtualized IT Services with traditional enhancements or value-adds; you need a new approach. Back-ups of Private Cloud and Virtual environments is not optional, your customers are demanding that you, as the chosen Service Provider, must provide them with a suitable Backup and Recovery solution for their vital IaaS, Public and Private Clouds. Symantec has partnered with Biomni to offer an integrated solution that couples Symantec’s industry leading NetBackup solution with Biomni’s Front Office XaaS, IT Self-Service platform. The net result is Backup as a Service (BaaS) and Disaster Recovery as a Service (DRaaS). A Multi-tenanted Backup and Recovery solution where customers and end-users can self- serve their Backup requirements, on-demand. A lot of people have said many things about Service Catalogue. But what is the reality? Has the Service Catalogue, as defined by ITIL V3 in 2007, been able to keep up with the demanding, highly tech-savvy, consumerized workforce? As a leading Service Catalogue tool vendor, we see these realities first hand… and we believe the ITIL V3 Service Catalogue is nearing its end! This may sound strange coming from a Service Catalogue vendor, but we have seen a definitive shift in focus and we feel this is a game changer. So join Biomni’s CEO Angus Gregory and ITSM commentator Rob England (aka @TheITSkeptic) for a lively debate on what the world’s leading IT organizations are actually implementing and the business value that they are driving for IT and the businesses they support. Biomni and the IT Skeptic, aka Rob England, are back and we continue to 'chew the fat' on all things Service Catalog. In the session we will be discussing the basics of Service Catalog adoption, how to start your own journey towards Service Catalog excellence and when is the appropriate time to start thinking about a Service Catalog tool. Software vendors, us included, are always quick off the mark to sell the 'must-have' benefits of our tools but often our potential customers are a long way behind us, in terms of maturity and what they might actually need today (rather than tomorrow). This session will provide you with the practical advice on where/how to start off and how to steer yourself towards the ultimate end-goal of a consumerized IT Services Portal. Since the launch of ITIL V3 some 5 years ago the Service Catalogue has emerged as a high-value win for both the business and the IT organization. However, there’s still much debate and general uncertainty around what a Service Catalogue actually is, what it should contain and exactly what value it has to offer. Taking ITIL Service Catalogue education and theory into a real-life practical adoption is often a huge barrier for many IT organizations. This webcast will also serve as the launch of a series of Service Catalogue group forum sessions where you can share ideas, ask questions and collaborate with ITSM/Service Catalogue experts. Rob England, aka the IT Skeptic, is a leading independent IT commentator and consultant, blogger, coach, trainer, and published author. He is best known for his controversial website and alter-ego, The IT Skeptic. He has twenty years experience mapping business requirements to IT solutions, ten of them in service management. He has written many articles and papers, and several books. He is active in the itSMF (the professional body for ITIL) and a member of ACM, ISACA and the NZ Computer Society. Angus Gregory is the founder and CEO of Biomni, the leaders in independent Service Catalogue software solutions. We know all about the value of the IT Service Catalog and the huge benefits that a successful project can deliver to the business, end-users and the IT organization. Not only will your Service Catalog provide a better level of customer service to your business users or customers but also help your IT organization transform into a service-orientated business partner. However, there’s still much debate and general uncertainty around what a Service Catalog actually is, what it should contain and exactly what value it has to offer. Taking ITIL Service Catalog education and theory into a real-life practical adoption is often a huge barrier for many IT organizations. Front Office Essentials is the cost-free entry level edition to the Front Office suite and provides foundation Service Portfolio/Catalog management and publishing functionality. If you are starting your Services Catalog initiative and need a market leading, built for purpose content management system to help you define, manage and publish your service offerings to the business, then Front Office Essentials is perfect for you. Enabling your employees with a Business-centric portal through which they can raise and track their service requests on-demand is a big ticket win for IT and the business. Join Biomni and Symantec for an introduction to this exciting joint proposition and learn how we can improve service delivery, reduce costs and increase customer satisfaction within your business. Biomni is the pioneer of user-centric Service Catalogue solutions which make IT self-service a simple realty for business customers. Enabling the business to consume their vital IT needs quickly and without complexity helps drive business productivity gains and achieve overall business objectives. Biomni also helps IT departments deliver and support an ever-increasing range of physical devices, software and cloud/virtual infrastructures. As the leading innovator of Service Catalogue software that is ‘independent’ of the Service Desk or any other technology, Biomni’s customers benefit from an unparalleled solution that actually addresses the business customer rather than trying to serve their needs via a technical agent-focused toolset.